Puerto Rico has received a fraction of the funds needed to recover from this. Despite the long-standing tradition of bipartisan support for funding to support victims of natural disasters, the Republican-led Senate failed to advance two disaster aid bills because of a fight over funding for Puerto Rico. After the devastation of Hurricane Maria over a year ago, the island is still on its journey of recovery as homes continue to be rebuilt and basic services, like internet and electricity, have not yet been fully restored. But President Trump told his Republican allies in the Senate that he would not support a package that included any further aid to the Spanish-speaking US territory. Senate Democrats insist that any disaster aid bill include real assistance for Puerto Rico, but Senate Republicans, following the President’s lead, seem unwilling to negotiate. The relationship between the mainland United States and its island territory Puerto Rico is fraught with historical and present-day imperialism, racism, and economic tension. In the aftermath of Hurricane Maria, nearly half of mainland Americans did not realize that Puerto Ricans are citizens of the United States. President Trump’s comments pit the needs of famers recovering from flooding in majority-white states like Nebraska and Iowa against the needs of already marginalized Puerto Ricans as they recover from Hurricane Maria. Christians are called to resist this kind of favoritism and injustice. As the writer of the Epistle of James reminds us, neither midwestern farmers nor Puerto Ricans are the problem. 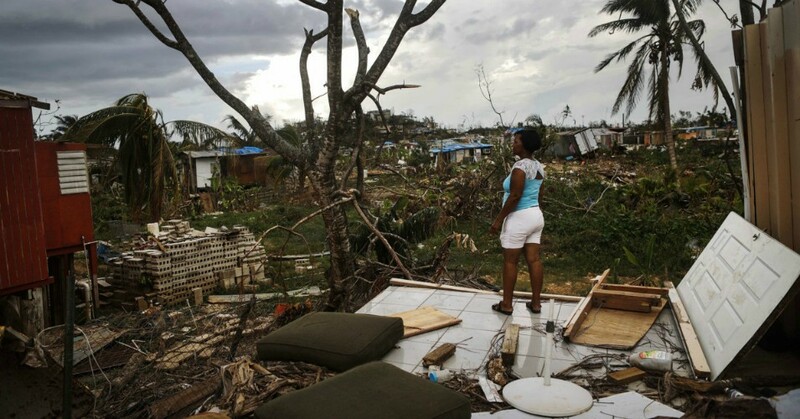 The same imperialism and racism that marginalized Puerto Rico in the first place continue to exacerbate the effects of Hurricane Maria and to contribute to environmental racism across the world. Loving our Puerto Rican neighbors means ensuring they have the resources they need to recover from disaster - and challenging the powers and principalities that continue to oppress them. Disaster profiteering is one of the ways that the effects of natural disasters like hurricanes and floods are multiplied in already marginalized communities. Educate yourself on this crucial element of the politics of disaster recovery by reading John C. Mutter's The Disaster Profiteers: How Natural Disasters Make the Rich Richer and the Poor Even Poorer. You show special love and concern for the poor, oppressed, and marginalized. so that the powers of this world might reflect your radical love and mercy.